There appears to be no birth registered in the name of Frederick Arthur Barr in Stokesley district. However, there is one for an Arthur Frederick Barr, born towards the end of 1873. Whether or not this is indeed our man, Frederick Arthur Barr was certainly the son of Hannah Barr, who was born in Bilsdale and was herself the daughter of Oliver Barr and his wife Ann. In the 1881 census, Hannah was living at her father’s 123 acre farm in Seamer with her parents, her sister, Sophia, born 1880, her five brothers and her son Frederick. Not very far away from the Barr family lived blacksmith Robert Appleton (61), born in Seamer, and his son Robert, also a blacksmith, who married Hannah in Middlesbrough Registration District later that year. In 1891, Robert and Hannah Appleton were living at the Bull and Dog Inn, next to the Three Tuns in High Street, Stokesley with Hannah’s sister Sophie, and Hannah's firat born son Frederick. There were also two children of the marriage, ER Oliver Appleton (3) and David Stephen WIE Appleton (1), both of whom were born in Seamer. The family can be found at Ropner’s Cottage, Seamer, in the 1901 census, but at this time Frederick was away fighting in the South African Wars. There are nevertheless five children at home: Ada (17), Ernest (13), Sidney (10), Lily (8) and Violet (4). In 1911, Frederick was back, living in Seamer with his brother Ernest Appleton (23) and his sister Ada Appleton, (28). (Robert, Hannah and Violet were nearby in Newby). Frederick described himself in the census of that year as a photographer, one more activity to add to the number ascribed to him in the Book of Remembrance, where he is said to have been an innkeeper at Stokesley, a dancing master, a member of Stokesley Volunteer Band and a long-serving vice-captain of the Stokesley cricket team. Frederick must have been a very familiar and popular figure in the town. His photograph shows a relaxed and jovial expression, and fits well with the sociable nature which we might expect from this account of his varied and active life. 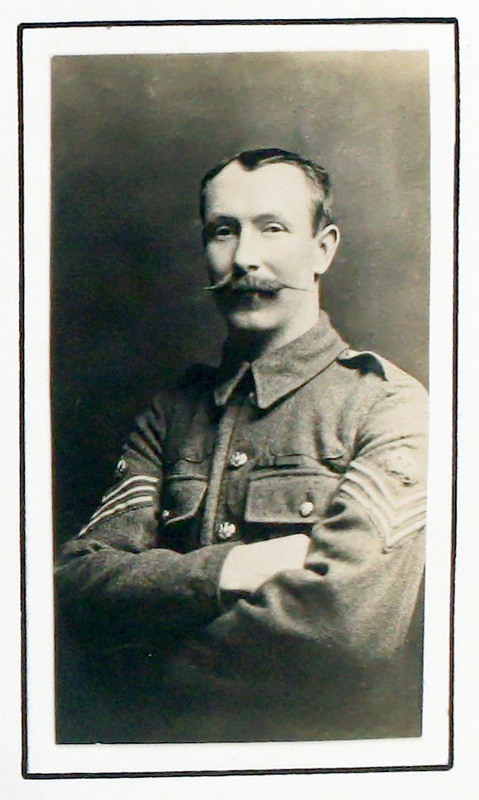 He had already enjoyed a successful military career, serving as a volunteer (Corporal 7290 of the 1st Volunteer Company of the Yorkshire Regiment) in the Boer War. His enlistment papers record that he signed on at Richmond on 20th January, 1900, at the age of 26 years and 3 months. He gave his Trade or Calling as Blacksmith, obviously having learned the trade from his stepfather. His medical inspection tells us that he was over 5’ 8’’ tall and weighed 131 pounds. His chest size was given as 34’’ and he was said to have a fresh complexion, hazel eyes and dark brown hair. Frederick served in South Africa from February 1900 to June 1901 and was awarded campaign clasps for Johannesburg, Diamond Hill, Belfast, Cape Colony and the Orange Free State. We are told that he had also been awarded the Queen's Medal. On 17th April, 1915, Frederick’s Battalion (territorials) having been amalgamated with the 4th Battalion, was drafted to France and exactly a week later, on 24th April, it went into action at St Julien and St Jean near Ypres on the Western Front. QMS Barr was wounded and taken to Boulogne General Hospital, where he died the following day. The action in which he fell is described in the official history of the Division, and quoted in an excellent website created by Bill Danby of Skelton entitled The 1/4th Battalion, Alexandra Princess of Wales' Own Yorkshire Regiment. "On through Fortuin the two Battalions went, next encountering the enemy in force advancing south of St Julien. They forced the enemy to give ground and drove him back into the village. They then found themselves up against a muddy stream, known as the Hannebeek, on the southern exists of St Julien and, the crossings being swept by heavy rifle and machine-gun fire, the two Battalions were forced to take what cover presented itself. Casualties during this affair were severe, but the counter-attack was completely successful and, besides preventing the Germans from making any further advance on the 24th reflected the greatest credit upon the two gallant Battalions." 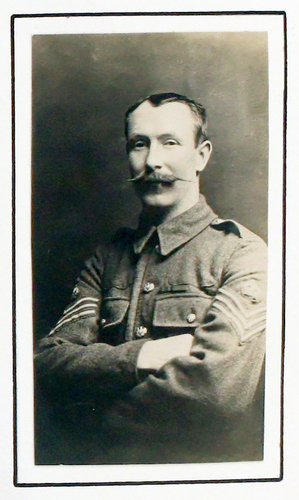 CQMS Barr was one of three brothers who served, of whom two fell. For his half brother, see Appleton S.
Frederick Arthur Barr was 43 years of age when he fell, and was awarded the British War Medal, the Victory Medal and the 1915 Star. His body lies in Plot VIII A 25 of the Boulogne Eastern Cemetery, Pas de Calais. Go to next soldier: Barrett J.